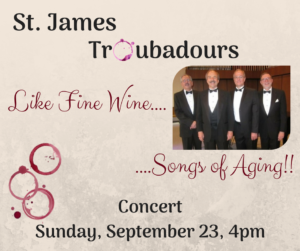 The St. James Troubadours are back in concert! Vocalists Wayne Hill and Dwight Michael accompanied by Michael Matsinko and Tim Braband will present a program Like Fine Wine – Songs of Aging. and some piano duets as well. A surprise at the end of the program will again leave you saying, “What will these guys do next?” Only time will tell. You don’t want to miss this show. Remember parking meters are enforced on Sunday afternoons in the borough.